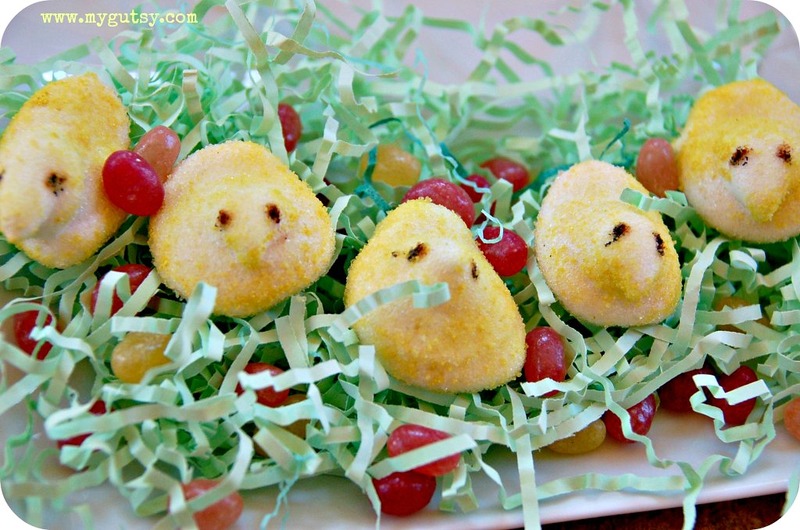 Celebrate Spring with some homemade honey peeps! 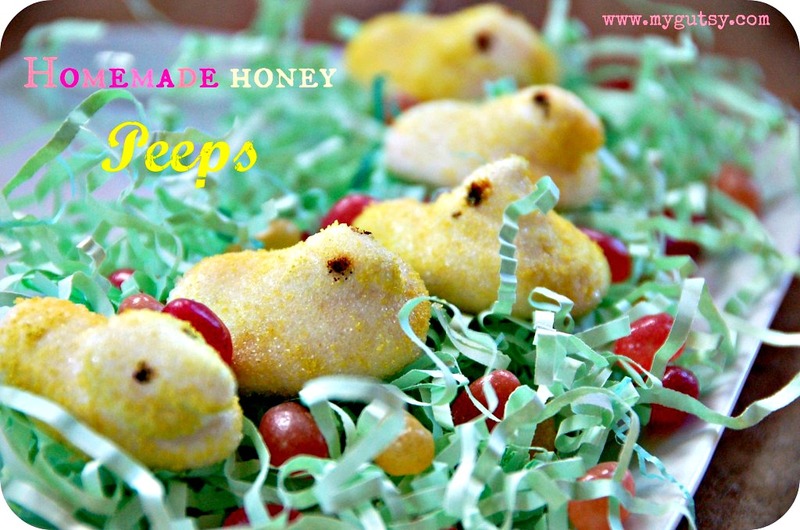 Why make homemade honey peeps?? Free of yellow food coloring. Made with 100% grass fed gelatin (I use this one —> grass fed gelatin ). Reduces allergy symtoms! Yellow coloring is made from powder quercetin. Made from grass fed cows. Help support hair, skin, and nail growth. 1. Make the marshmallow base. Use this recipe. I would suggest to cut it in 1/2 because it makes alot! 2. Let the marshmallow base sit for a bit after making it. This will allow you to pipe better fuller bodied peeps. Just watch the marshmallow cream to make sure it does not get too hard to work with. You can try piping a few but you will know when it is perfect consistency. 3. Get a plastic baggie and fold edges over a cup. This makes it easier to scoop the marshmallow cream into the bag (like I did in this recipe with the chocolate). Cut a small hole at the bottom of the bag. SUGAR- If you want the traditional coating mix the quercetin and sugar until a nice yellow color. COCONUT- If you are on GAPS or paleo, use shredded coconut and pulse it in the Cuisinart to make it finer. Blend in the quercetin. Sprinkle mixture (which ever one you choose) onto a cookie sheet. 5. 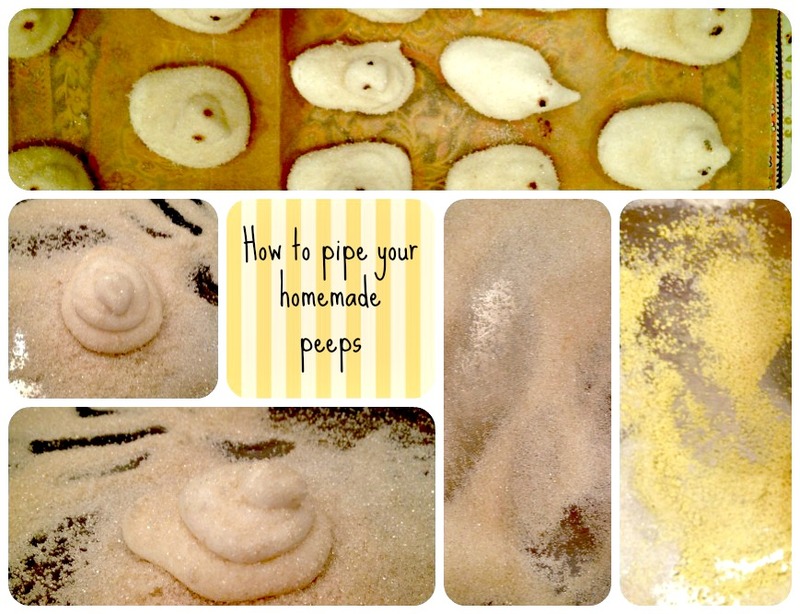 Pipe your Peeps. I have my own method of doing this. Start with the bottom. It should be the longest section (oval with a fuller front) You can try to make the tail pointed. Then sprinkle in sugar coating. Pipe the head (circle). Sprinkle with sugar. Pipe the beak (circle and swoop up!). Sprinkle with sugar. 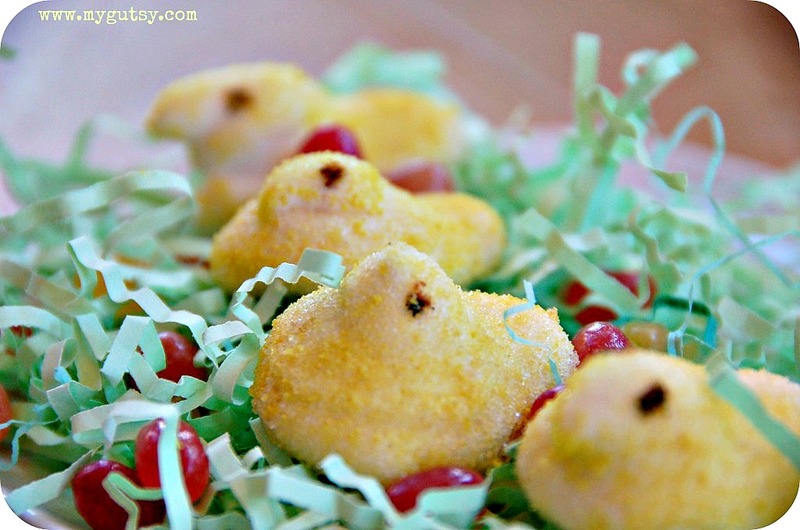 If you are using the coconut shreds then I would suggest piping the peeps first without sprinkling the coconut in between. It is too heavy and will flatten the peeps more. Just pipe like I said. Wait until they harden a bit, but are still sticky and then sprinkle. 6. Make “eye” paste. Mix some cocoa powder in a bit of honey and use a toothpick to dab on the eyes. You can also use the vanilla bean seeds if you have any left over. The cocoa powder/honey works and looks better though. 7. Let set out uncovered for a few hours or until they reach the hardness you like. Once they are just how you like them, store in an an air tight container (not in the fridge). Delicious! These peeps are gooey. fresh. fluffy. sweet. and made with love. Caroline, these are the cutest things ever! And you are SO creative to use the quercetin as a natural food coloring. I add quercetin to my smoothies and it turns them yellow. Since I have all the ingredients on hand, I will make these soon! Hey Lauren, I knew you would know quercetin!!! Oh my goodness, these are adorable!! Thanks 🙂 Too cute to eat almost! Can you replace the honey & sugar for a natural sugar free sweetener like stevia, etc?. Cutest. Thing. Ever! Could you make a recipe for Stage 1 GAP’s diet? Thanks! Sally sure! my bother started GAPS intro again before flu season to jump start his immune system so I will have more stage 1 posts shortly.